High quality and safe:MIREN silicone ice pop molds is made from 100% premium food grade silicone. It is BPA free, FDA approved,eco-friendly,reusable and durable. Quick-freeze and no mess design let you can make the perfect ice pop. Fun colors: Our product has 8 vibrant colors(red, green, yellow, orange, purple,light blue,dark blue and pink) - each with a matching lid. Both kids and adults will love them. Great for the whole family. Easy to use: Frozen pop treats recipe inside. No need stand. Freeze them upright/lay on their side. Easy to clean: Hand wash, or throw it in the dishwasher for an easy clean. Also ,we offer you a free clean brush to make the wash become more easier. Size: Each ice pop maker is about 8 inches long and holds 3.4 fl oz (1/2 cup). 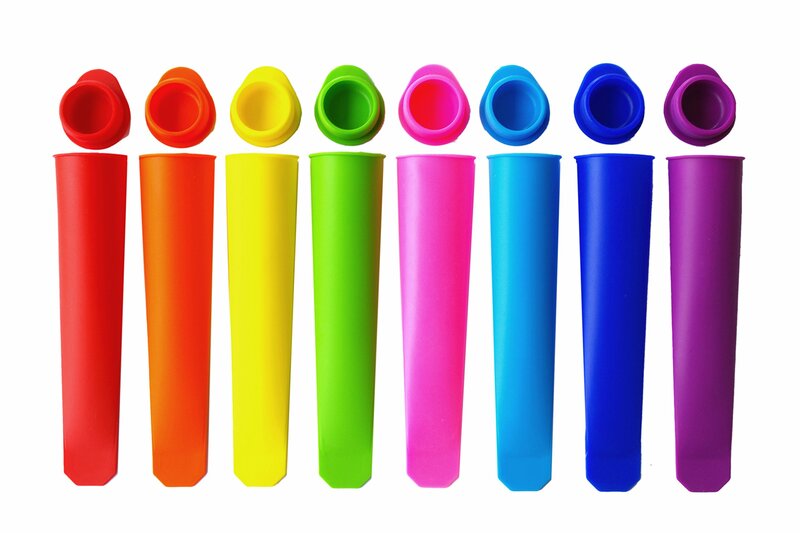 Color: 8 Vibrant Colors MIREN silicone ice pop molds'special features will make you love them instantly. 1. They are made from 100% BPA Free,FDA approved,food grade silicone,safe andreusable.Save your money,good for the environment and take you a healthykitchen life.Our ice pop molds are a great way to include healthy foods inboth you and your children's diets. 2. Easy to use and easy to clean. Our silicone ice pop molds are an easy,no fuss way to make the perfect icepop.The no mess design simply remove the lid and the ice pop easily slidesright out.No need to worry about them melting all over the place! MIREN silicone ice pop molds are fully dishwasher safe,even after repeatedwashes.We offer you a good clean partner-a clean brush.Clean them will be in ablink of an eye. 3. Handy 8 pack means there are enough for everyone. 4. The Vibrant Collection includes brightcolors:red,green,yellow,orange,purple,light blue,dark blue and pink,your kidswill love them too. 5. Each mold holds 3.4 fl oz (8 inches long) and they take up little room inthe freezer. Show your creativity! Use our multi-use molds to rich your kitchen life.Colorful and fun will be full of your whole family. Use your imagination to creat more diets ... - Ice cream! - Frozen yogurt or pudding - Frozen margaritas or daiquiris And more more Or,you can let them have multiple uses... -Use them to store nuts,candy,fruit,chopped veggies and other miscellaneous items,either at home or on the go. -Store baby food or left over sauce/gravy. -Great for birthdays,pool parties or BBQs. How lovely MIREN silicone ice pop molds are!Add them to your cart right now!